While there could be a lack of monetary policy announcements during this year’s Jackson Hole summit – Yellen pretty much confirmed the start of balance sheet unwinding to be September and Draghi will try hard to prevent a Sintra-like experience – it’s likely a turning point in the history of central banks anyway. After Jackson Hole the language of the majority of the major central banks will probably become more hawkish. So what does the world look like after 10 years of relentless monetary easing? 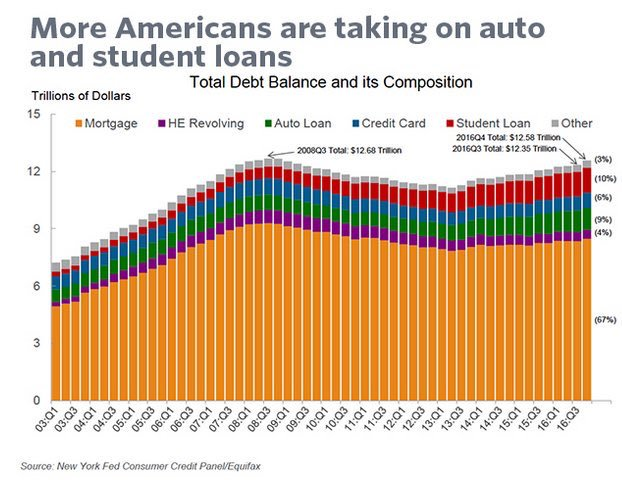 Let’s start with what will be one of the most intriguing charts in finance history. 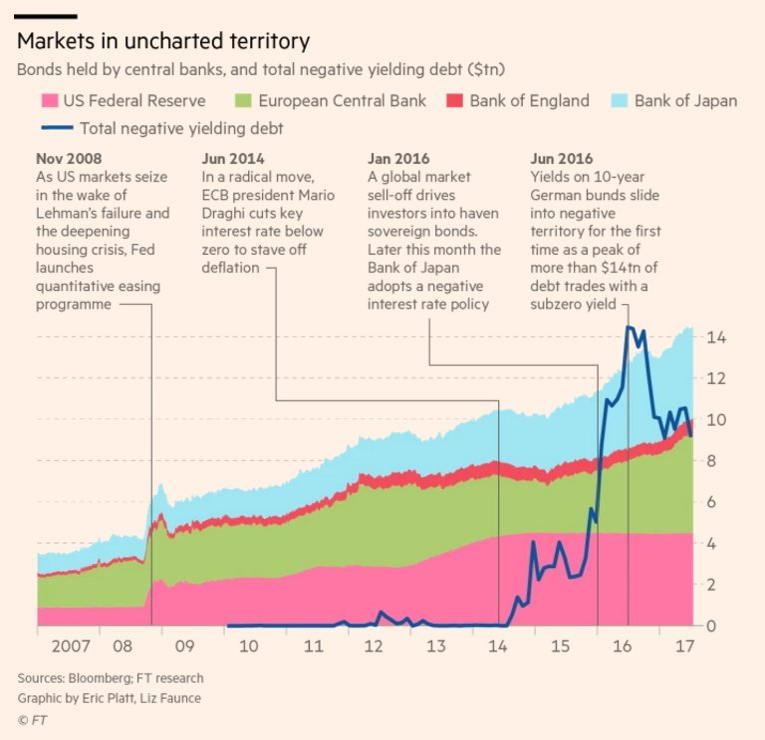 A massive increase in central banks balance sheets, matched by an even bigger increase in the amount of bonds with a negative yield. Unprecedented is an understatement. 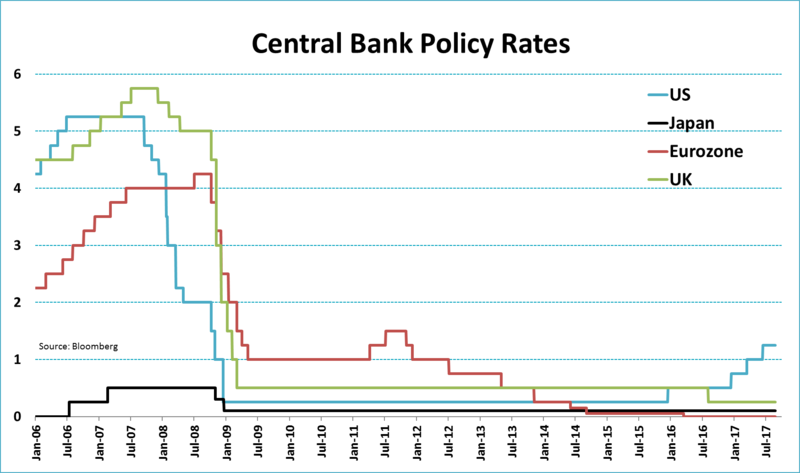 Currently, central bank policy rates remain extremely low. So far, only the Fed took back some of the abundance in liquidity. 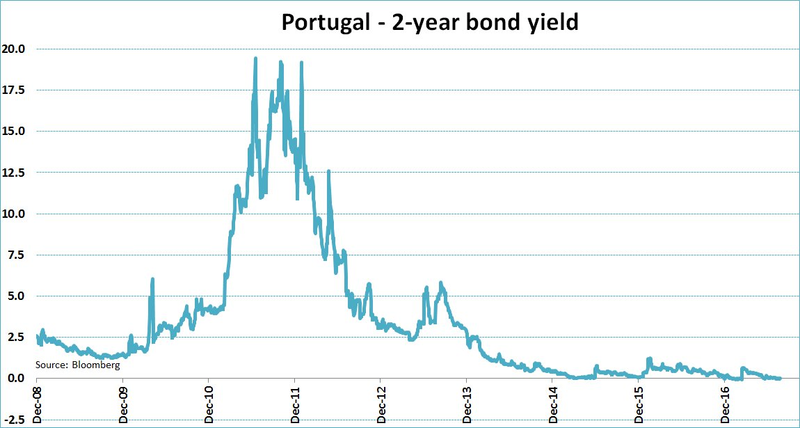 Lower yields mean higher bond prices. Around the globe, government bond investors have experienced very healthy returns since March 2009 (the low in equity markets during the financial crisis.) Eurozone bonds are up more than 46% since then, or roughly 4.6% per year, even as the average yield on the German 10-year government bond barely averaged 1.50%. Japanese government bonds are up 20% since March 2009, despite the fact that Japanese yields were already extremely low the begin with. Or take a look at the chart below. It’s one of my favorites to show there’s some crazy stuff going on in bond markets. The US 1-month Treasury yield lies way above the yield on the 50(! )-year Swiss government bond yield. Obviously, bond returns are nothing compared to equities. While it’s at least debatable if the extraordinary monetary policy during the aftermath of the financial crisis supported growth or inflation expectations, negative yielding bonds did push investors up the risk curve, straight into equities. The S&P 500 Index including dividends is up a whopping 18.8% per year on average since March 2009. 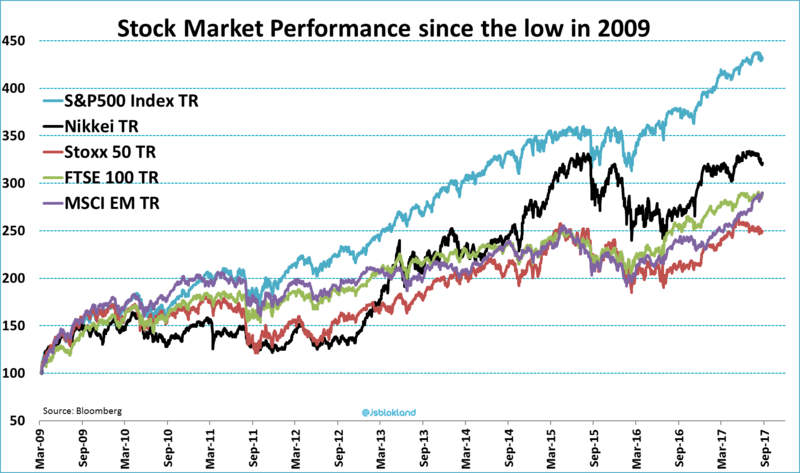 Eurozone stocks, which also had to cope with a government debt crisis, are the worst performing region. Nonetheless, they are up 11.4% per year on average. But there are less optimistic developments that could cause problems going forward. Historically low yields have persuaded households, corporates and governments to take up more debt. As a result, just ten years after the financial crisis, total debt-to-GDP in the US reached an new high. 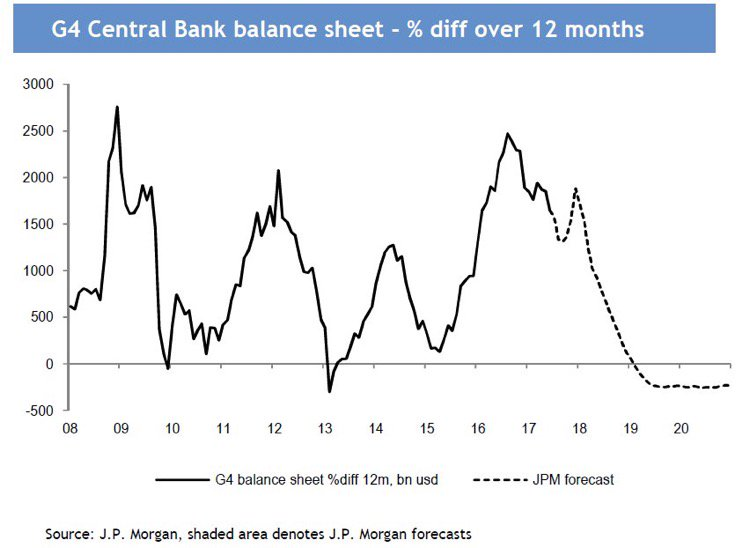 Two scary charts from JP Morgan to conclude. 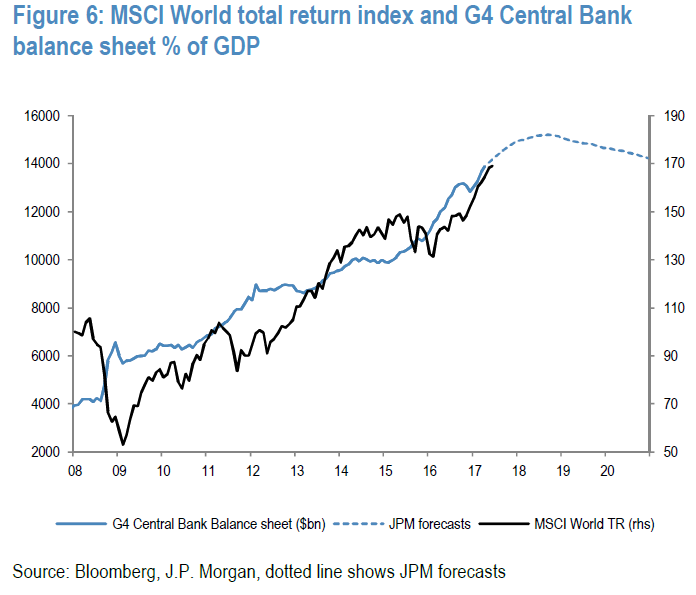 As said, Jackson Hole is likely a turning point in global central bank policy. The language will become less supportive, and not just from the Fed. This could very well lead to increased volatility and less abundant returns. We are in a pretty decent place given current GDP and earnings growth, but reducing global liquidity without causing a few hick ups seems almost impossible. Fortunately, central bankers have had loads of time to find a way to do just that. 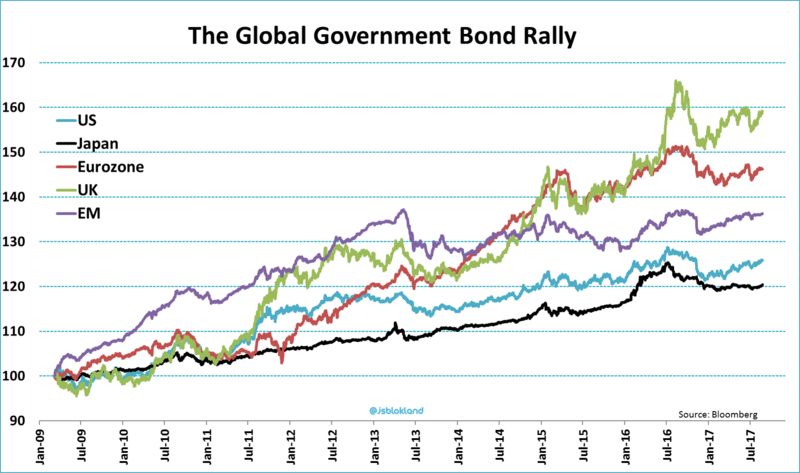 ← Have bond investors really gone mad this time?